Are you waiting for Guy Fieri to give you the rundown on the best food the Wisconsin Union has to offer? He probably isn’t stoppin’ by anytime soon. But, I’m channeling my best Guy Fieri (signature hair not included) to put together my own list of favorite Union eats you absolutely have to try. I’m not alone in loving the Margherita Pizza at Memorial Union’s Strada. It’s the most popular dish at this Italian street food destination. This Neapolitan-style pizza begins with a scoop of classic, light sauce. 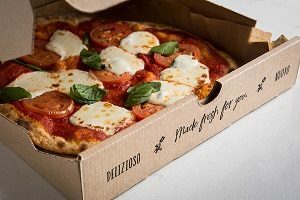 It’s topped with slices of fresh mozzarella and Roma tomatoes followed by a dusting of basil and parmesan. It’s then stone-fired to perfection in just a few minutes and served fresh, hot and made just for me. I’m not sharing, but you can come get your own. Plan your visit to Strada here. There’s something about the bratwurst from der Rathskeller, one of the Union’s famous and original restaurants. I don’t know if it’s the pillowy bun, the sweet, grilled peppers or the deliciously tart sauerkraut, but this is one of my favorite go-tos at Memorial Union. When in Wisconsin, right? Learn more about the place where you’ll get your brat goodness here. Somehow, feast doesn’t quite do this dish justice. You might want to loosen the belt a notch or two for this one. 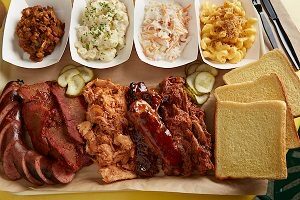 The Pitmaster’s Feast at the BBQ Stand boasts multiple different styles of meat, such as brisket and pulled pork. It also includes multiple sides, like creamy, rich macaroni and cheese and crisp coleslaw. Pro tip, dip a forkful of the brisket in your mac and cheese. You’ll thank me later. Grab your friends (and a few napkins), and dig in! More information on your Terrace BBQ destination will be available here later this summer. These are not your average cheese curds, folks. This dish is a whole new take on the Wisconsin classic. We’ve taken the cheese curds you know and love and dipped them in a golden beer batter. Then, we fry them to crispy perfection. Finally, we toss these savory beauties in garlic-infused oil, red pepper flakes and parmesan cheese. Are you set to go to the Sett yet? Check out all that the Sett offers here. Sweet and savory create a beautiful marriage of deliciousness in Carte’s Cranberry Harvest Panini. 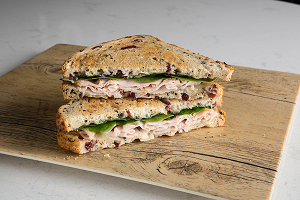 This popular sandwich is packed with layer upon layer of smoked turkey complemented by tangy cranberry mustard. Locally made Babcock Dairy brick cheese brings a mildly sweet flavor to this culinary creation while fresh, tender spinach adds another burst of sweetness to the made-to-order Panini. All of this is grilled within cranberry wild rice bread. Yeah, it’s a definite must-have. Learn more about this sandwich and all that this made-to-order sandwich and salad shop has to offer here. Prairie Fire, itself, is an experience. Add in delicious food, and it’s something too good to pass up. You might think I’m talking about your Union South go-to coffee spot. Sure, I’m a frequenter of the coffee side of this café. But tucked behind the coffeehouse side of Prairie Fire is a whole other dining experience. This side offers tapas and a variety of other beverages. While you can’t go wrong with any of the appetizers, you must try the Roasted Red Pepper Hummus with Pita. The hummus is sweet and creamy perfection that you’ll want to eat with a spoon. Go ahead. I won’t tell. With half-priced tapas Thursdays from 5-9 p.m., this will become your go-to place to relax and unwind at Union South. Learn more about your campus tapas oasis here. Don’t forget dessert! You deserve it. Our most Instagrammable (Urban Dictionary said it’s a word. I checked.) dessert is the Freshman 15. It’s is a crowd-pleaser that generates oohs and aahs from transfixed onlookers. Here’s why; it’s 15 scoops of Babcock Ice Cream flavors of your choice, five toppings of your choice, whipped cream, and cherries. I think this dessert pairs well with a beautiful view. It’s also served with up to 15 spoons, so you can share this sundae with friends or make new friends. At Memorial Union, enjoy this unforgettable dessert with friends on the Terrace, or take in the picturesque lakefront from nearby Lakeview Lounge. Learn more about where to get your Freshman 15 here. It’s hard to think of something more “Wisconsin” than Lakeview Lounge’s Beer Brat and Cheese Curd Signature Pizza. I know there are two pizzas on this list. But after you try them, you’ll understand why I had to add this to our Union must-haves. Forget the red sauce. This pizza is all about the cheese. We add beer cheese sauce to our crispy crust. We top it with slices of bratwurst, cheese curds, sweet grilled onions and bold mozzarella. There are no words. Try this cheesy masterpiece for yourself. More information about Lakeview Lounge will be available here later this summer. Didn’t see anything that caught your eye? Looking for something that meets your specialized dietary needs? To find your perfect Wisconsin Union meal, go to union.wisc.edu/dine/find-food-and-drink.